In this lesson, we will learn how to use the dot product to find the magnitude of a vector. 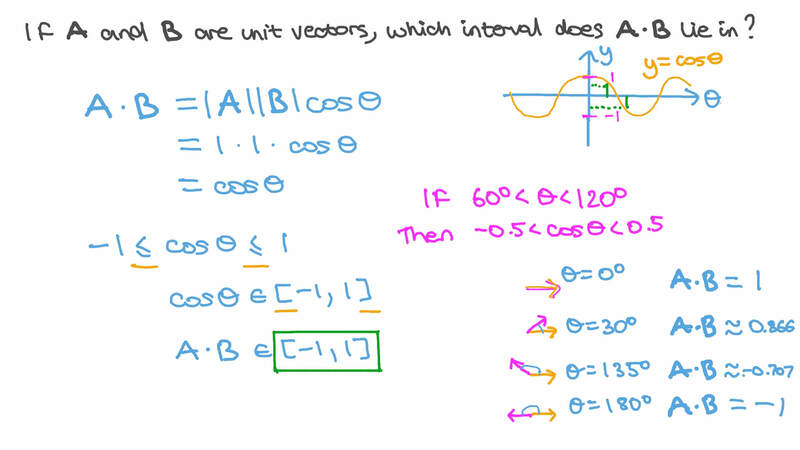 If ⃑ 𝐴 and ⃑ 𝐵 are unit vectors, which interval does ⃑ 𝐴 ⋅ ⃑ 𝐵 lie in? Square 𝐴 𝐵 𝐶 𝐷 has side 10 cm. What is  𝐴 𝐵 ⋅  𝐵 𝐶 ? If  ⃑ 𝐴 + ⃑ 𝐵  ⋅  ⃑ 𝐴 − ⃑ 𝐵  = 5 7 and ‖ ‖ ⃑ 𝐴 ‖ ‖ = 3 ‖ ‖ ⃑ 𝐵 ‖ ‖ , find ‖ ‖ ⃑ 𝐴 ‖ ‖ to the nearest hundredth. In rectangle 𝐴 𝐵 𝐶 𝐷 , we have 𝐴 𝐵 = 1 5 and 𝐵 𝐶 = 1 1 . Determine   𝐵 𝐶  ⋅  5  𝐷 𝐵  to the nearest hundredth. ⃑ 𝐴 ⋅ ⃑ 𝐴 = . In trapezium 𝐴 𝐵 𝐶 𝐷 , with parallel sides 𝐴 𝐷 and 𝐵 𝐶 , suppose ∠ 𝐴 and ∠ 𝐵 are right angles, and that 𝐴 𝐵 = 1 2 𝐵 𝐶 = 2 9 . 8 , while 𝐶 𝐷 = 3 9 . Determine  𝐷 𝐵 ⋅  𝐵 𝐶 . In trapezium 𝐴 𝐵 𝐶 𝐷 , with parallel sides 𝐴 𝐷 and 𝐵 𝐶 , suppose ∠ 𝐴 and ∠ 𝐵 are right angles and that 𝐴 𝐵 = 1 2 𝐵 𝐶 = 3 7 , while 𝐶 𝐷 = 3 9 . Determine  𝐷 𝐶 ⋅  𝐴 𝐵 . In trapezoid , with parallel sides and , suppose and are right angles, and that , while . Determine . If the two vectors and are perpendicular, determine the value of . If ⃑ 𝐴 = 2 ⃑ 𝑖 and ⃑ 𝐵 = ⃑ 𝑖 − 9 ⃑ 𝑗 , calculate the scalar product of ⃑ 𝐴 and ⃑ 𝐵 .
and Find ⃑ 𝐴 ⋅ ⃑ 𝐵 . Given that the norm of A is 4 newtons in the direction of 4 5 ∘ north of west, and the norm of B is 21 meters in the direction of west, determine A B ⊙ . If ‖ ‖ ⃑ 𝐴 ‖ ‖ = 1 7 , ‖ ‖ ⃑ 𝐵 ‖ ‖ = 1 2 , and ⃑ 𝐴 ⊙ ⃑ 𝐵 = 1 0 2 , find the measure of the angle between the two vectors. 𝐴 𝐵 𝐶 𝐷 is a trapezium, where 𝐴 𝐷 ∥ 𝐵 𝐶 , 𝑚 ∠ 𝐴 = 𝑚 ∠ 𝐵 = 9 0 ∘ , 𝐴 𝐷 = 1 2 𝐵 𝐶 = 2 0 c m , and 𝐶 𝐷 = 2 2 c m , evaluate  𝐵 𝐷 ⊙  𝐵 𝐴 . Given that 𝐴 𝐵 𝐶 is an isosceles triangle, where 𝐴 𝐵 = 𝐴 𝐶 = 1 9 c m and 𝑚 ∠ 𝐴 = 5 1 ∘ , determine  𝐵 𝐴 ⋅  𝐵 𝐶 correct to the nearest hundredth. If 𝐴 𝐵 𝐶 is an equilateral triangle of side 4.75, find  𝐴 𝐵 ⋅  𝐴 𝐶 approximated to the nearest hundredth. If 𝐴 𝐵 𝐶 is an equilateral triangle of side length 29.9 cm, find  𝐴 𝐵 ⋅   𝐴 𝐶 +  𝐶 𝐵  . Equilateral triangle 𝐴 𝐵 𝐶 has side 6.6. Find  6  𝐴 𝐶  ⋅  5  𝐶 𝐵  . Equilateral triangle 𝐴 𝐵 𝐶 has side 46.6. Find  𝐴 𝐵 ⋅  𝐵 𝐶 to the nearest hundredth. For the unit vectors ⃑ 𝑖 , ⃑ 𝑗 , ⃑ 𝑘 , what is ⃑ 𝑗 ⋅ ⃑ 𝑗 ? For the unit vectors ⃑ 𝑖 , ⃑ 𝑗 , ⃑ 𝑘 , what is ⃑ 𝑖 ⋅ ⃑ 𝑗 ? If is a parallelogram in which , , and , evaluate . Given that 𝐴 𝐵 𝐶 is an isosceles triangle, where 𝐴 𝐵 = 𝐴 𝐶 = 6 c m and 𝑚 ∠ 𝐴 = 1 2 0 ∘ , determine  𝐶 𝐴 ⊙  𝐵 𝐶 . Given that 𝐴 𝐵 𝐶 is an equilateral triangle whose side length is 57 cm, and 𝑀 is the point of concurrency of its medians, evaluate  𝑀 𝐷 ⊙  𝑀 𝐹 .